Today I am going to let you all into my online earnings and show you where some of my income comes from online. 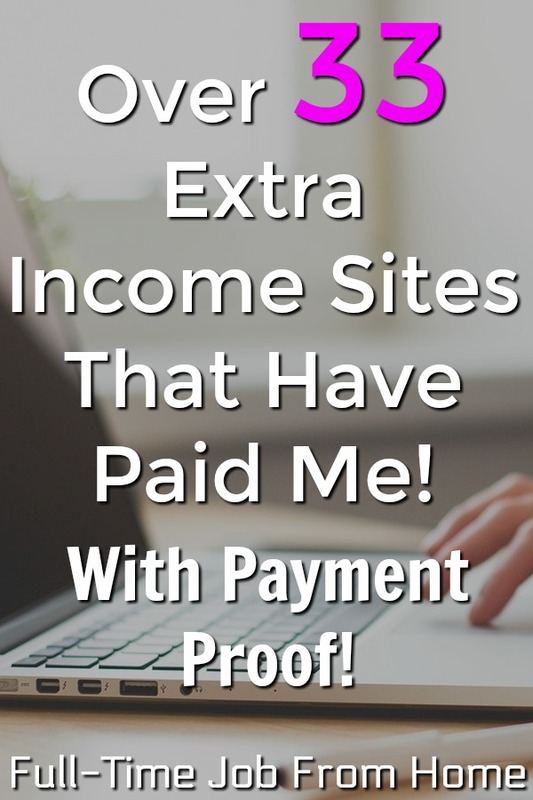 I am a big believer in having income from a lot of different places online and make a solid amount of money online just from the sites listed below. Below is a list of all the companies that send me a check each and every month. Take advantage of as many or few as you like. This is a resource for you to show you how I make a solid living online. Please know, that these sites are just extra income sites that you can use to make a small online income. If you’re looking for a full-time online income, check out My #1 Recommendation, it’s how I made over $13,000 last month! If you have questions, feel free to contact me directly here or leave a comment at the bottom of this page! I’m now doing monthly income reports; you can see all of my income reports here. Fusion Cash is a site that pays you to do things such as take surveys, complete offers, watch videos, and inviting your friends. It’s one of my favorite “get paid to” sites, and I highly recommend it to people looking to make money online. They have a $5 sign up bonus when you join. You can see below that my account now has over $41 in it! This is a site you want to join! With a huge $5 sign up bonus you should have no problem cashing out soon. Swagbucks.com is one of my favorite sites to make money with online. You can pretty much get paid for doing everything, such as searching, completing offers, taking surveys, watching videos, playing games, and much more. Last month I earned $25 from Swagbucks in Amazon Gift Cards. Payment Proof picture is below! Currently Offering a $5 Sign Up Bonus! 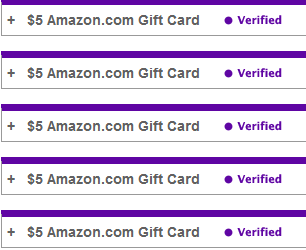 Here is proof of $25 worth of Amazon Gift Cards! You can make money just by searching with Bing. With Bing Rewards, you earn points for completing searches through Bing. These points can be exchanged for gift cards. Last month I received a $3.00 Amazon gift card for just searching with Bing, and guess what I use Google 80% of the time! You can find proof of my payment below! Read My Full Review On Bing Rewards Here! CashCrate is another site very similar to SwagBucks. Cash Crate lets you earn in many ways like taking surveys, completing offers, watching videos, playing games, and referring others. I have been a member of CashCrate for a while and get paid every month! You will see proof of payment below! Read My Full Cash Crate Review Here! Survey Savvy is a highly trusted pure survey sites. Survey Savvy sends surveys directly to your email, and you get paid on completion. Take a look below for payment proof. Paid Viewpoint is a modern survey site. They only send you surveys that your pre-qualified for. No more wasting your time just to be turned down for a survey. They pay well for each survey and pay with PayPal! Minimum cash out amount is $15, and they pay within 24 hours! You can see my payment proof below! Read My Full Paid Viewpoint Review! Wealthy Affiliate is an affiliate Marketing Training University, but they pay you for helping with training and referring others. Not only do you get the best training in the world, but you can also get paid for it! Here is proof of payment for just helping out in the community! Read My Full Wealthy Affiliate Review Here! HealthyWage is a site that will pay you to lose weight and be more active. You do have to be money, but the return on your investment is pretty good and you can have some extra motivation to lose weight and be healthy. BitcoinGet is a reward site that pays you to take surveys, complete offers, watch videos, and refer friends. When you earn 1,000 bits you’ll get paid in Bitcoin to your Bitcoin Wallet! Visit BitcoinGet.com to sign up for free! Gomez Peer Zone is a website performance monitor that you install on your computer. The program is extremely safe, and no personal information is tracked. You earn cash for every minute you have Gomez Peer Zone running in the background of your computer. I have been using this program for a few years now, and I consistently earn an extra $5-10 a month! Read My Full Gomez Peer Zone Review Here! Inbox Dollars is a survey site very similar to CashCrate. You can get paid to take surveys, complete offers, watch videos, play games, and refer others. Inbox Dollars also lets you get paid for reading emails. It’s one of the only sites that offers this way of earning and it’s why I highly recommend this company! Send Earnings is a survey site extremely similar to Inbox Dollars. They are owned by the same company. The layout and earning options are the same as Inbox Dollars so take your pick of which you like better or join both! I was recently paid by check! Adf.ly is a link shortening service that shows ads and pays you for clicks on your links. You can earn from people clicking on your link, your referrals earnings, and by selling ad spots. I was recently paid by PayPal! Qmee is a company that pays you for clicking on paid search ads within the most popular search engine results such as Google, Bing, Yahoo, Amazon, & eBay. It is one of my favorite companies for getting paid for searching, and you will agree after learning more. I was recently paid by PayPal within 5 minutes of asking for a cashout! Ibotta is a mobile app that pays you to shop. It works by downloading the app and finding items that Ibotta will pay you to buy. Go to the store and purchase the different items. Make sure to get a receipt. Upload a picture of your receipt with your smartphone to get paid! I recently cashed out $11.40 via PayPal which you can see below! InstaGC is a paid to do site. They pay you for completing offers, tasks, listening to music, visiting sites, watching videos and much more. I was recently paid by InstaGC with a $1 Amazon Gift Card. You can also cash out via Check, PayPal, and Direct Deposit. Ebates is a website that gives you cash back on all your online purchases. Ebates has the largest directory of stores online and pays high percentages on your total purchase. I was recently paid $54.10 for my recent purchase on Amazon. You can see proof below! ClixSense is a site that will pay you to visit other websites or in other words, visit ads. You will be taken to a website and need to view the site for a few seconds. You can also earn with surveys and offers. 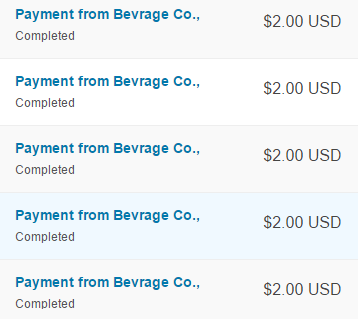 Here is my latest payment from ClixSense via PayPal. Earnably is a site very similar to CashCrate or Swagbucks. It’s a paid to do site. You can earn by taking surveys, completing offers, watching videos, listening to music, and much more. Earnably starts paying at $2 with PayPal and Amazon Gift Cards. You can see below proof of a $2 PayPal cash out! Prize Rebel is a rewards site that pays you to do things like take surveys, watch videos, and much more. They have hundreds of gift card options and PayPal payments starting at $5. Here’s proof a PayPal payment I received. The BevRAGE app pays you cash back on all of your alcoholic beverages. Similar to Ibotta, but with Beer, Wine, and Liquor. Payments are made via PayPal. You can see proof of a few of my payments below. To learn more visit BevRAGE, or download the app and enter code: FTJFH, to earn a sign-up bonus! FeaturePoints is an app that pays you to download other apps. It’s extremely easy to use and is available on IOS and Android devices. You can get paid with gift cards or PayPal payments starting at $3. 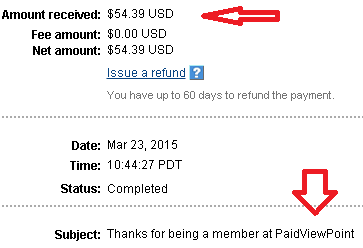 Here’s proof of $10 PayPal payment. Visit Featurepoints.com to join or download the app and enter code: 4YK9XY , to earn a sign-up bonus! GiftHulk is a reward site that offers several ways to earn like taking surveys, completing offers, watching videos, and much more. They have 100s of gift card options and cash payments starting at $5. You can learn more by visiting my GiftHulk review or join now at GiftHulk.com! Drop is an app that pays you automatic cash back to popular stores like Walmart, Amazon, Target, McDonald’s and many more! All you need to do is link a card to get started! 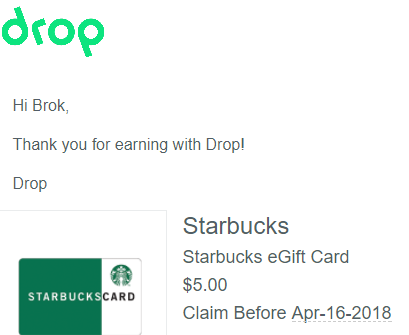 Drop has gift cards starting at $5 to stores like Starbucks, Amazon, iTunes, and many more. To learn more visit my Drop App Review or download the app and enter the code: 1dei0 to earn a $1 sign-up bonus! The drop app pays you for online shopping, in-store shopping, and booking travel plans. All you need to do is link a card to get started. No need to ever scan a receipt! Pays via PayPal or Direct Deposit once you earn $15. You can learn more by reading my Dosh Review or join by visiting their website. Baymack is a site that lets you earn daily sweepstakes drawings by watching YouTube videos. You’ll earn an entry for every five videos you watch. They have a daily drawing with thousands of winners each day. If you win you can get paid via PayPal starting at just $.02. To learn more visit my Baymack review or join at Baymack.com! 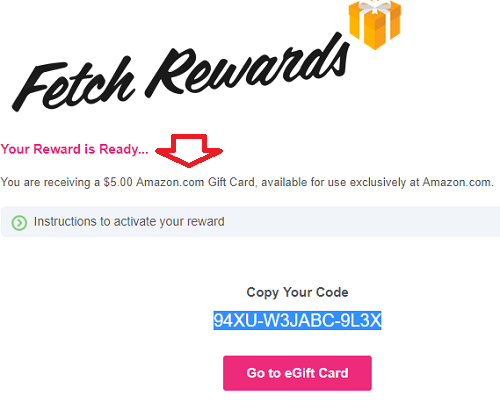 Fetch Rewards is a cash back shopping app similar to Ibotta, but instead of having to buy certain items, you earn points for any receipt you upload and bonus points when you buy products from participating brands. They have several gift card options including Amazon starting at just $3. Here’s proof of a $5 Amazon gift card I received. To learn more visit my FetchRewards App Review. The achievement app pays you to walk and link your Apple Health, Samsung Health, or Fitbit account. You’ll earn points that you can exchange for $10 PayPal payments. To learn more or to join visit Achievement.com. To learn more read my Joany Review or visit Joany.com to get started with the survey. To learn more or to join, visit my full GetUpSide Review or visit GetUpSide.com to join for free! Sweatcoin is an app that pays you points for every outdoor step that you take. You can exchange your points for fitness related products/services such as running shoes or a free month of a workout service. CoinOut is a new app that was actually featured on an episode of Shark Tank. They will pay you $.04-$.10 for every receipt that you scan. 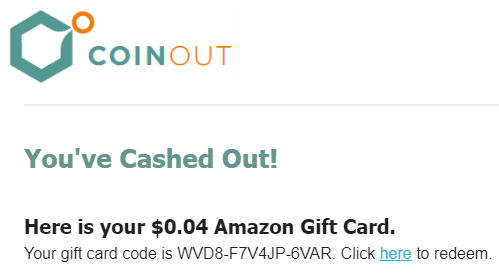 The awesome thing about CoinOut is they do not have a minimum cash out amount, which means you can get paid via Amazon gift card after scanning one receipt. To learn more or to join, visit CoinOut.com or read my full CoinOut Review. Thanks for taking a look at the companies that pay me online. Every month I promote new sites, so this list is always growing! Make sure to check back often to see new opportunities that you can make money with. 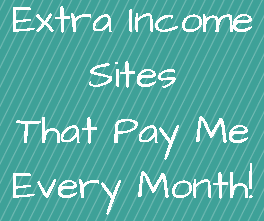 You can see a list of all the sites I use at Extra Income Sites I Use. Do you want to see how I make most of my income online? Check out My #1 Recommendation to learn how I made over $13,000 online last month! What sites do you make money with? Tried any of these sites? Let me hear what you have to say in the comments below!